When trying to think of things to make for Lindsey and Johnny's shower, coming up with make-ahead savory appetizers was the hardest part. I was sold on doing bacon wrapped apples until just a day or two before the shower. Then I decided I didn't want both of my savory options to be bacon and I was already making the apple shaped bacon cheddar ranch cheese ball. So, I called a game time audible and switched to sausage meatballs. I knew these would be a hit because Lindsey used to make similar meatballs (without the apple) when we would have game nights at her house. So, I went to work! I actually made the meatballs two days ahead of time and put them in the freezer. That way all I would have to do the afternoon of the shower is get them out and put them in the oven. The meatballs were just bigger than bite size (maybe even bite sized depending on your mouth and your manners!) so they cooked quickly even from frozen. 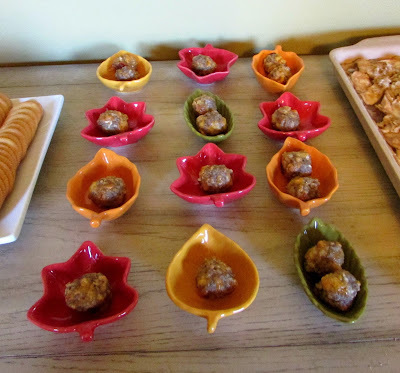 They were popular too, I only had three meatballs left after the party! Shape into small (about 1") meatballs. Don't pack too tightly, just enough that they hold together. Either place on a lightly greased rimmed baking sheet and bake immediately or place in the freezer until ready to use. Bake at 375 F for 12-14 minutes if baking immediately or 16-17 minutes if baking from frozen. Follow Cooking With Carlee's board Sucker for snacks on Pinterest. Carlee these meatballs looks so good and I bet are yummy. They are the perfect appetizer for a party. Have a wonderful Friday and weekend. They were gobbled up quickly, that is for sure! Have a wonderful weekend! These would go so well on my smoker. Thanks for the recipe, apple will go so well with the sausage. Oh yum, they would be perfect on your smoker! You might as well just always keep that thing on ;-) My mom and I are always talking about what you've been making! Great for game day! So glad you shared with us at Merry Monday. We love good recipes! 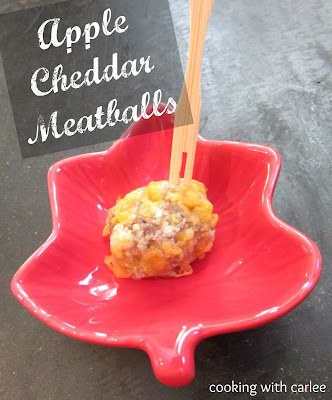 They would be perfect for game day, or even an appetizer at Thanksgiving! Thanks so much for hosting! Ha! It seemed a bit earlier than normal, but I saw it and pounced!